This Series is one of those that presents something that folks sometimes don’t get the first time ’round, as the saying goes… A person, individually, can usually handle something being pointed out to them, when they know the person has their best interest at heart, but a group of people make that practice MUCH more difficult. This is not the first Series created on consequences, but is presented in a manner of perspective of choices – which are ours individually to make. Life is comprised of moments, choices and the results that both of those have on all who are involved, both directly and indirectly. Whoa, did you catch that fully? Moments happen each second of the day, they stop for no man, woman, boy, girl, animal, plant, insect or even an Amoeba. We make choices in each of those moments, whether we realize it or not – doing something is a choice and refraining from doing something is a choice. There are results that come about for everything that is done or having been refrained from doing. The sum of those is what we refer to a consequence. Sometime they are made of bad choices, which garner not so pleasant consequences, while others have made good choices, which have resulted in good consequences. We have a magnificent guide and consequence meter built into us as Christians – our Heavenly Father puts Him there – that small, still voice… The Holy Spirit. Mind you, and remind myself, we need to put ourselves in a place where we can not only hear the Holy Spirit speak to us, but rather further be where we can “listen” to Him. If we only “hear” Him, that is choosing to give Him no more of you than the rustling leaves, floating down an empty street. Rather, if we are willing to humble ourselves, placing our selves into a position of “listening” to what He has to say and have the desire to do the Will of God, we then are choosing to used by Him to impact those around us for His Glory, His Honor and His Consequence. Choose carefully and wisely, some of the consequences we don’t consider to be all that important, have Eternal ramifications that we may not understand until we are shown at a time where our influence may no longer have any effect. There are fourteen (14) standard prints presented with verses of Scripture from both the Old Testament (OT) and the New Testament (NT) directly placing before us challenges of and through the choices that we make as they relate to what our Lord would have us do and who we influence for His Namesake. In a world where so much of what is being done is false, dishonest, unjust, vile, ugly, of a negative report, having no virtue, not worthy of any recognition, do NOT let your mind focus on these things! Let it NOT be said of you or seen in you, any of these things, for in none of them is God pleased to see His children. Sounds awful doesn’t it? That is the “other” side of Philippians 4:8-9, which could be any of us, in a moment of time, if we allow it to be so. We should desire consequences of/from our decisions, the good ones that come from godly and right decisions being made in our every day lives that have an impact not only in our direct surroundings, but in everything we do, say, go, be… Consider the ramifications “when you choose” to do each thing of each day, for there will be consequences – the good or bad of them will be closely resemble our Walk with our Master and Saviour. I have desire to see the consequences of my dedication to Serving Him show up in every thing that is done in and through my life. 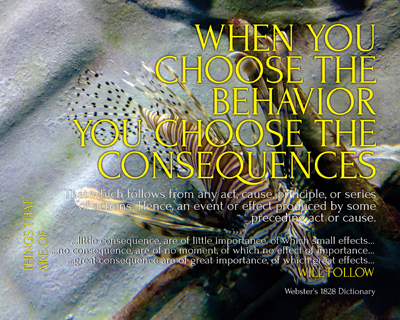 How are others considering your consequences?